My trip to London (see earlier posts) wasn’t focused on the Bible but English literature—Dickens, The Beggar’s Opera, Shakespeare, Wordsworth—but we crossed paths with the KJV translators many times. Lancelot Andrewes, the prodigiously learned Dean of Westminster, was director of the first company of translators at Westminster (his ornery brother Roger was on the first Cambridge company). I and my students toured Westminster Abbey, where Andrewes and his team worked, in the “Jerusalem Chamber” where King Henry IV died, as described in Shakespeare’s play. We also went to Southwark Cathedral on the Southbank, which wasn’t a cathedral in the seventeenth century, but rather St. Saviour’s Church. 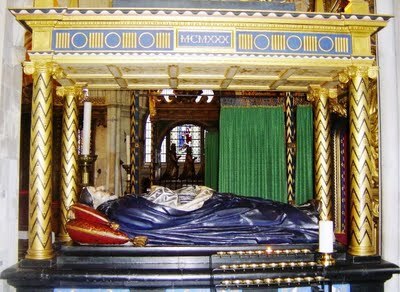 The image above is of Lancelot Andrewes’s fabulous tomb in that church. Wherever you go in London, church and theater overlap. Also buried in Southwark Cathedral are playwrights John Fletcher (who collaborated with Shakespeare) and Philip Massinger, Philip Henslowe (who ran the Admiral’s Men), and Shakespeare’s younger brother Edmund. Many of the players at the Globe, the Rose, and other theaters, were members of St. Saviour’s. As Bishop of Winchester (from 1618), Andrewes’s palace was next door. He was probably often in St. Saviour’s, though after Shakespeare’s death in 1616. Long before then, however, Andrewes also preached regularly at the court of James I. Since the King’s Men often performed there too, he and Shakespeare may often have been under the same roof. James Shapiro writes about one such possible occasion at Richmond Palace during Lent in 1599. Shakespeare may not have worked on the King James Bible (more on this next week), but he certainly lived in the same city with men who did. This entry was posted on April 17, 2011 by Hannibal Hamlin. It was filed under From the Curators, The KJB in History and was tagged with Authorized King James Version, Jerusalem Chamber, King James Bible, Lancelot Andrewes, London, Manifold Greatness, Ohio State, Southwark Cathedral, Westminster Abbey, William Shakespeare. And now there’s a mention on our Facebook page, too! Thanks so much for your note, and your interest in the Manifold Greatness blog!